Clear brackets work just like metal braces with one important difference: because they're translucent, they blend into your teeth for a look that's much less noticeable than traditional braces. Made of ceramic, they're the perfect blend of strength and beauty. They're perfect for both teens and adults who need traditional orthodontic treatment but wish for a more subtle look. 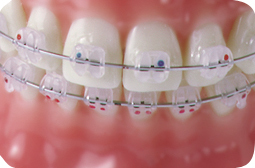 Over 1 million patients have been treated with Clarity clear braces. Dr. Emma and Dr. Rodis can help you determine if Clarity is right for you.